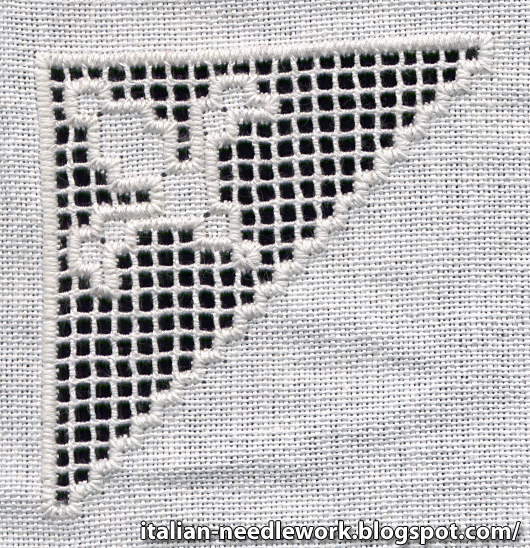 Sicilian Drawn Thread Work - new book! Back in 2007 when I attended the Italia Invita Forum in Rimini, I took a two-hour class with the author of this book, Giovanna Gurrieri. It took intense concentration both to learn the technique and understand the Italian but I wanted to learn it so badly and to learn it from this maestra because she is so talented and makes such beautiful things. I was sure my little class which consisted of three other ladies (all Italians) thought I was very strange as I asked very detailed questions and stopped to write notes constantly because I did not want to get home and not remember anything. 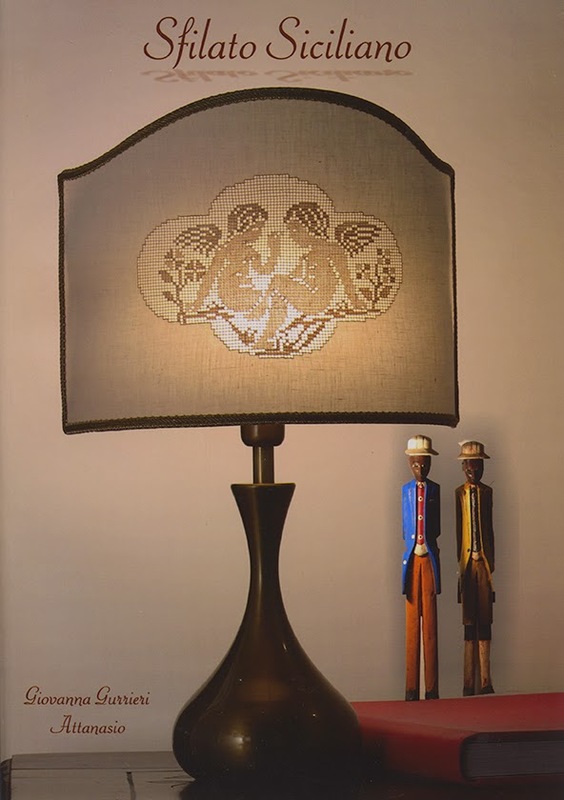 Giovanna Gurrieri comes from Ragusa, a town in Sicily that is famous for its Sicilian Drawn Thread Work. This book is her commitment to passing on this wonderful technique and to aid in this, the text of the book is in three languages: Italian, French and English. To my knowledge this is the only book on Sicilian Drawn Thread Work in English. 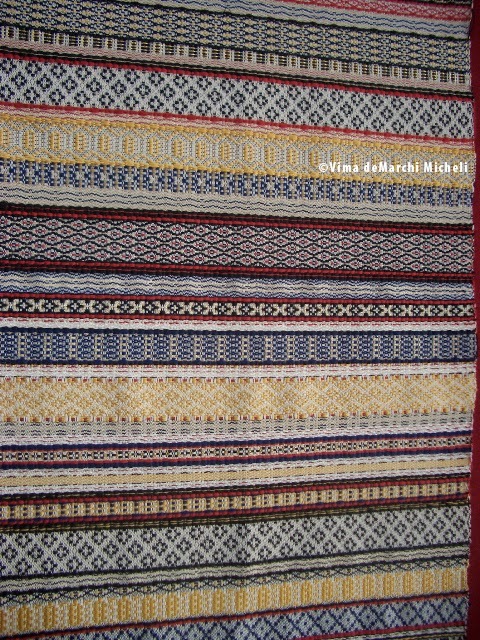 After the preface, there is a page on the history of this technique and then a section on the materials required, two methods of transferring designs on to the fabric, the correct and incorrect ways to cut the fabric, information on the various styles (of which there are five: 400, 500, 700, Inverse and Chiaramonte), discussion on even weave and non-even weave fabric, how to work the embroidered netting, changing your thread, working the overcasting stitch for the 500 and Inverse styles which includes changing threads and working corners, working the darning stitch for the 700 style, the Chiaramonte stitch, washing, ironing and care instructions. Note: there are no instructions on the 400 style though there are a few tips and information about it. The book is 56 pages and 8.25 x 11.75 inches. 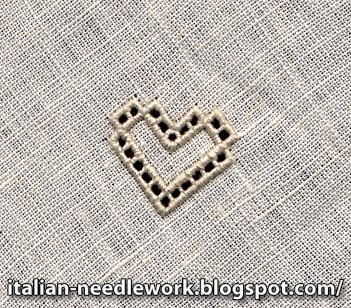 400 style uses the darning stitch and the cloth stitch. 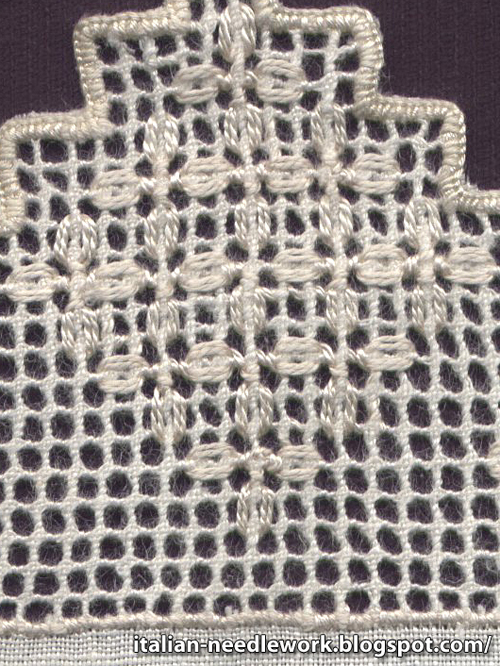 500 style uses the overcast stitch around the perimeter of the designs. 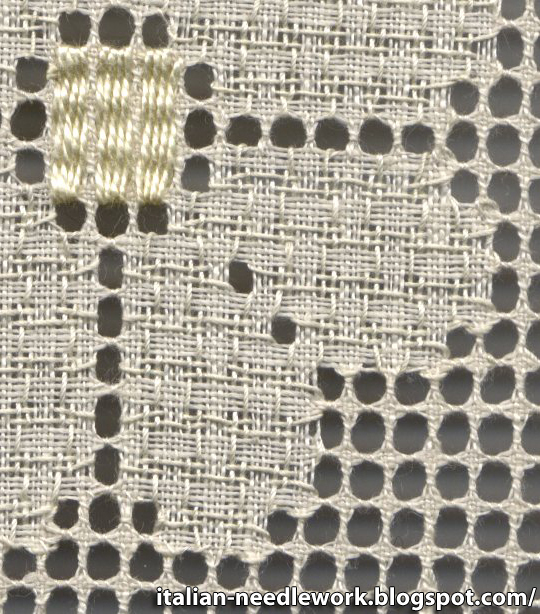 700 style uses the darning stitch. 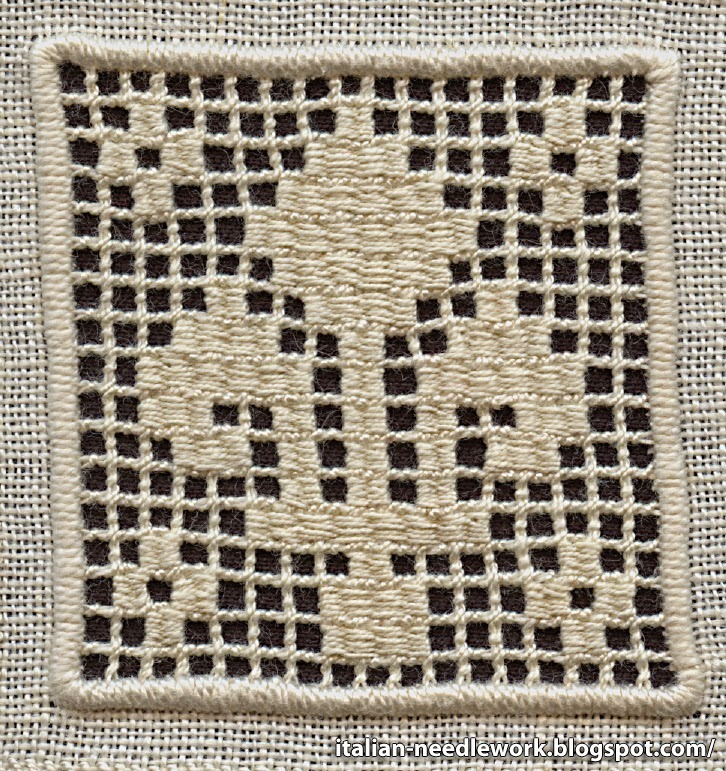 Inverse style uses the overcast stitch around voided designs. Chiaramonte style uses this characteristic motif. 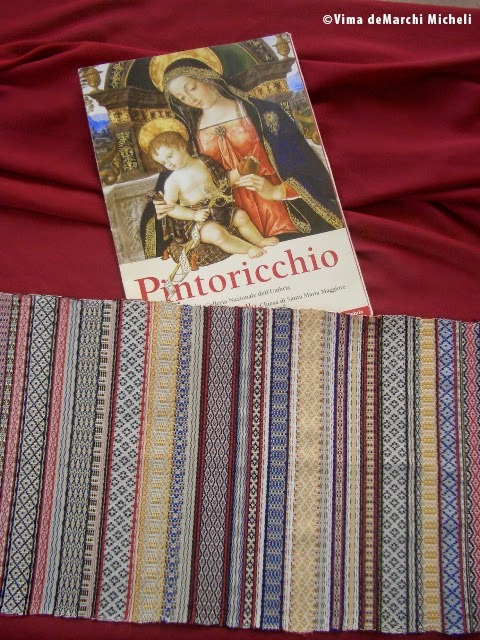 I look forward to a time when I can sit down with this manual and finally start a work of the 500 style which is my favourite Sicilian Drawn Thread Work style. You can purchase this book from Tombolo Disegni, send an email to order. Sometimes people do things that make you absolutely marvel at their talent. 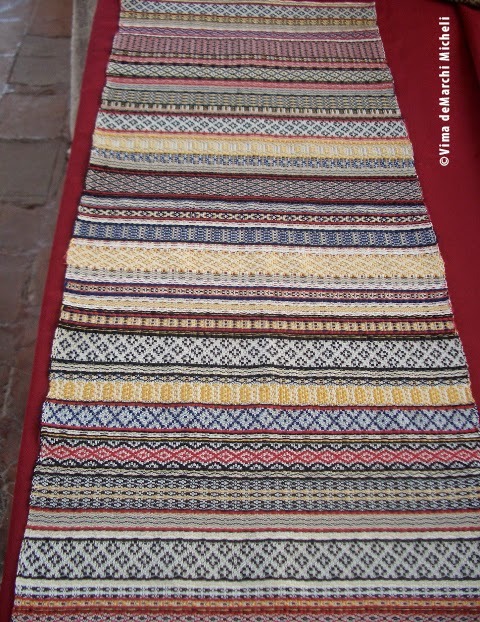 Marta Cucchia of the Giuditta Brozzetti Weaving Studio in Perugia is one of those people who does this to me. Everything Marta makes is amazing. 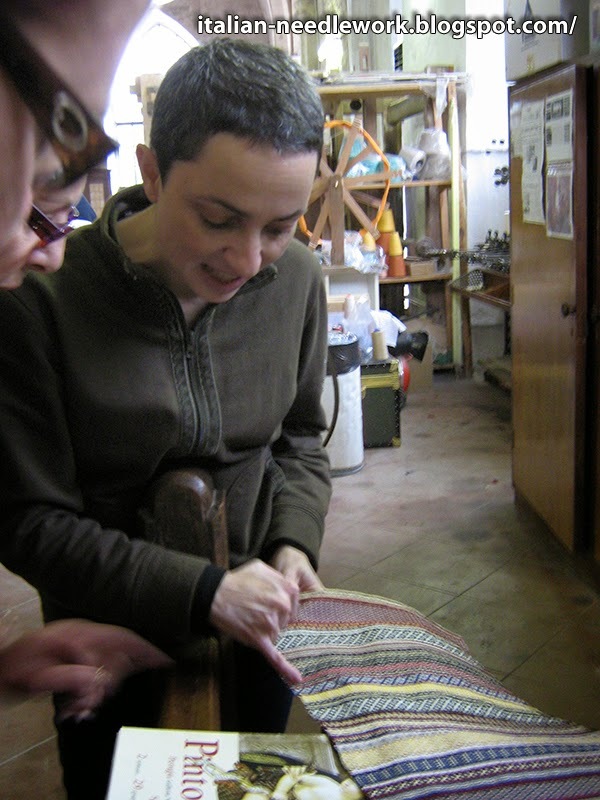 I've told you a little about her and the Giuditta Brozzetti Weaving Studio before. I had the enormous good fortune of visiting them in 2009. Back then Marta had recently finished a piece she had been studying and figuring out from a Pintoricchio painting. She explained how she was fascinated by the designs on the fabric in the painting and thought to challenge herself by recreating the piece. The piece is quite long and each line is a different pattern! 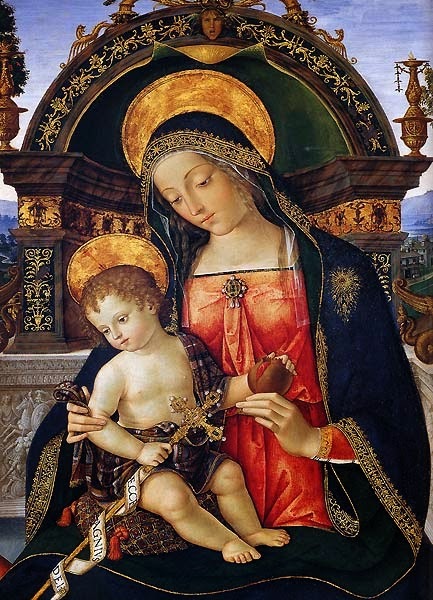 The inspiration for this work is the cloth that the Baby Jesus is wrapped in in this Pintoricchio painting which can be found in the Galleria Nazionale dell'Umbria museum in Perugia. I am still in awe of Marta's talent five years later. She continues to do amazing work and is always finding new things to challenge herself with. 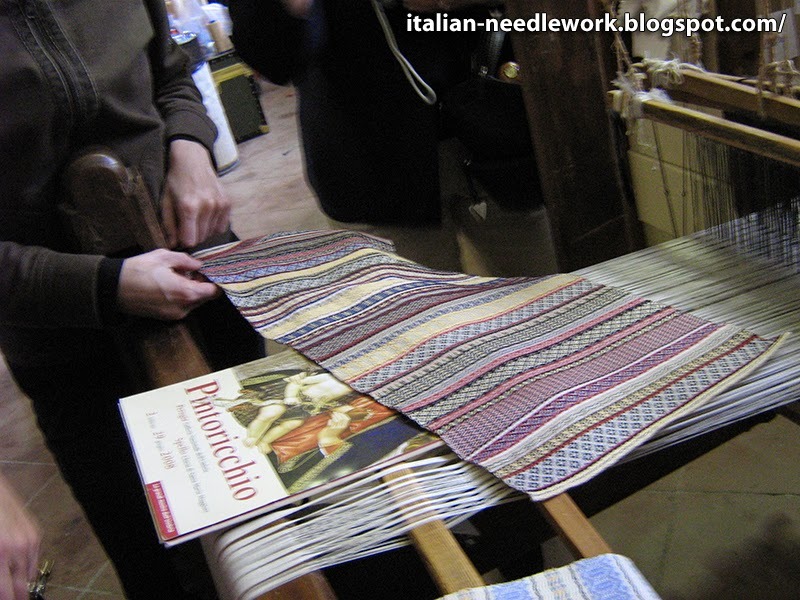 If you ever find yourself in Perugia, you should not miss a trip to the Giuditta Brozzetti Weaving Studio, they have guided tours (in English too!). Thanks to Vima for the use of her photos!